There is no need to go to a homophobic bakery for your wedding cake. Also, there is no need for celebrity cake gurus to fly into town and save our weddings. There are plenty of queer bakers in town. 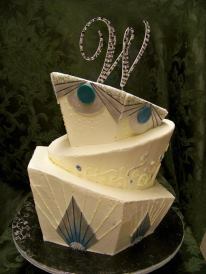 For instance, you can get your wedding cake at Pastrygirl, one of the best queer-owned bakeries in town. Your cake will be tasty, decadent, gorgeous, LOCAL and gay gay gay. Located on Stark Street in the Montavilla neighborhood, lesbian baker Laura Widener is making some might cool wedding cakes for all lovers of cakes. She does not discriminate. If you like cupcakes or maybe pie instead of cake, she’ll take care of your wedding dessert needs. No matter if you like chocolate or vanilla or a fruity flavor, Pastrygirl is here to suit all tastes and deliver on your wedding day. Your wedding day is too special to waste time and money on someone who doesn’t support your love. And, keep your queer dollars local. Get your wedding cake at Pastrygirl. This entry was posted in business, lesbian, marriage. Bookmark the permalink.